In the future, astronauts will be accompanied by tiny robot companions. These robots will most probably have a variety of hand/tool attachments, jetpacks, magnetic feet, and various lights and cameras. Cartoons and literature tell us these robots will also have quirky personalities and emotional problems. Until that bright future arrives, we have the Space Man Moppel. The Space Man Moppel is the perfect buddy for the sci-fi lover. 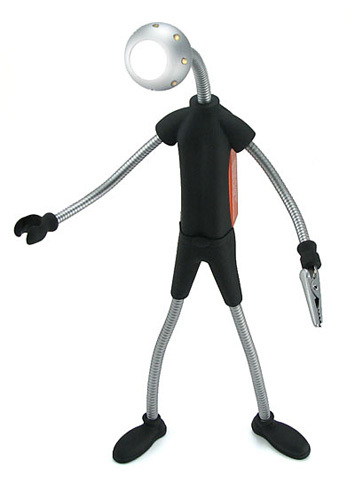 Each foot has two power magnets, so the Space Man can stand in almost any pose, any direction, and any gravity! The arms, legs, and neck are super bendy, too. One hand is molded to hold a cable or two, and the other is a strong alligator clip for securing notes, thin wires, or anything else your mind can imagine. With a push of the button, your Space Man Moppel's head will illuminate an area of your workspace in a soft, white, LED glow. And there is nothing as lovely as an LED glow.